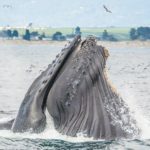 My recent whale-watching excursion onto/into Monterey Bay (California) was a journey in gentleness, quite a contrast from most trips where the Pacific Ocean is far from docile. We encountered still air and silky smooth waves, lake-like ocean waters with a thin but complete fog layer. On this particular trip, the boat naturalist told a story of a trip that she took earlier this year, and an event that was observed by many naturalists and biologists. It truly reveals the complexity of awareness and connection amongst our fellow Earth dwellers. On that trip, the naturalist observed a pod of Orcas (Killer whales) hunting a Grey whale calf travelling north with its mother. 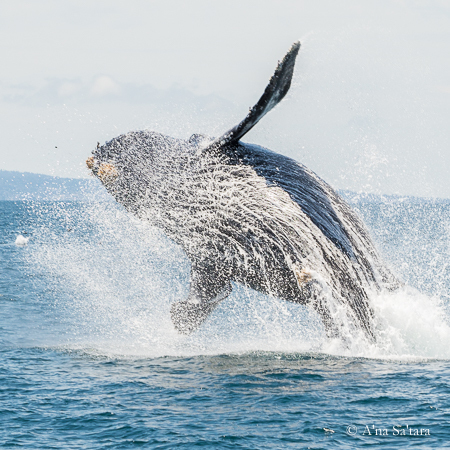 In this instance, in the vicinity where the Killer whales were pursuing the Grey whale calf, there was a small group of Humpback whales. To human amazement, the Humpbacks intervened, putting themselves between the Killer whales and the calf, over and over again. 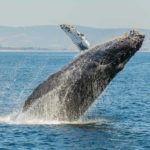 Some of the Humpbacks moved in between the Killer whales and Grey whale calf, and others directly harassed the Killer whales. 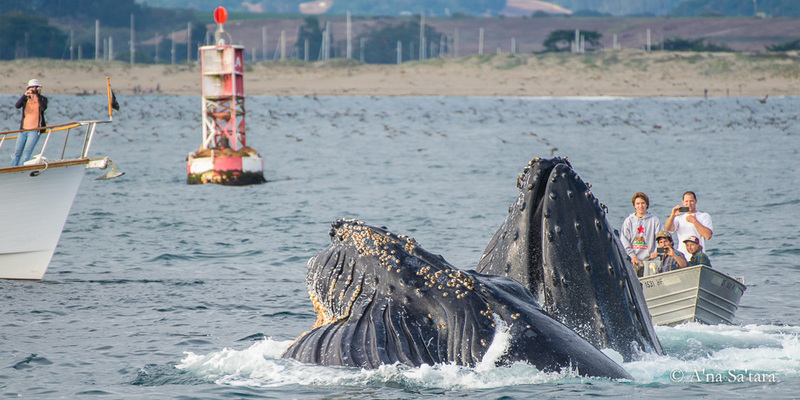 The Humpback whales had nothing apparent to gain — these were three different whale species from three different parts of the world, lives intersecting for maybe 30 minutes. She also mentioned a report, filmed by the BBC in Antarctica, from 2009. A seal was being chased by Killer whales and it swam towards a Humpback whale in the area. The whale lifted the seal out of the water with its flipper and deposited the seal on its belly (the whale had rolled over, forming a temporary “ice berg” out of danger). Does this happen often? How can we know? 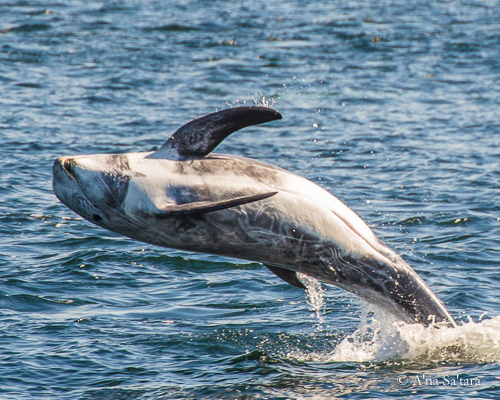 One observation that I can make, from my interactions with the whales and dolphins of Monterey Bay, is that there are strong energetic differences amongst them, both between species, and amongst different members of the same species. My husband Paul was the first to notice this with dolphins; in a short period of time on one trip, we observed three different species. What a different energetic ‘signature’ each species had, and different intensities of resonance with our heart centers! 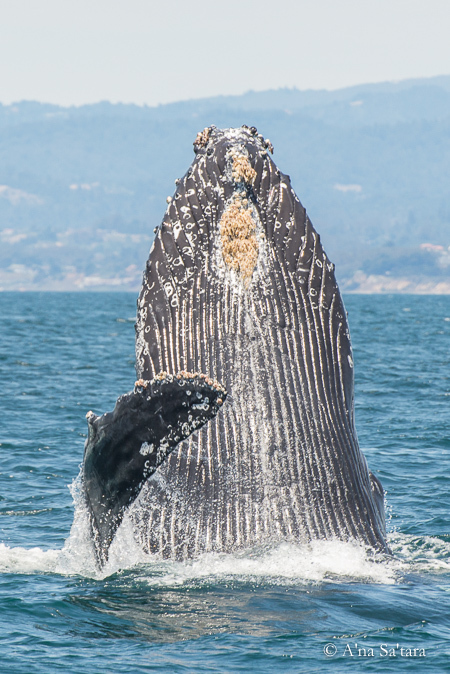 In my experience with Humpbacks, they are as distinct as people — some are available to connect and communicate, and others are not. With much time on the northern California coast, I have “researched” many of the coastal ley lines and energy nodes of the area. As part of my inquiries and healing work, I have worked with many whales and dolphins. These experiences have given me a different perspective on these ocean dwellers and their place on Earth. When we think of lightworkers creating pathways of higher consciousness for Earth, our human lives lead us to look and think about what is close around us. Our terrestrial perspective, however, is misleading. The surface of third dimensional Earth is about 70% water … why would such a large area be neglected in the transformation of the planetary system? One of the key roles of light beings is to anchor higher vibrational frequencies of energy and awareness. These “anchored” energy fields assist the ascension process and awakening pathways in several ways. One is to create a resonant field for other beings, assisting them in elevating their own vibration. Second, they provide a type of conduit for ascension activations and openings for high vibrational frequencies to enter the otherwise dense field of the third dimensional Earth. Think of this as like a lightning rod for cosmic frequencies and galactic consciousness. Third, and this depends upon crystal (or soul) DNA, an individual can transmit information, DNA activation codes, and healing sacred geometry to other beings whom they contact (physically or through higher dimensional connections). This role is more like an antenna. These descriptions are a bit simplified, and many aspects can occur simultaneously. But recognizing these three particular “roles” helps us to understand the powerful and different ways that high vibrational beings participate in the ascension pathways and elevate our planetary system. While some starseed ocean dwellers are well-recognized, there are other dolphin and whale forms who are genetic hybrids. Not all are of a high vibrational and elevated nature; I have observed quite a range of beings in the oceans, just as on land. So it is not so simple to say that “whales are Pleidian or Sirian” or whatever. And, just like amongst human third dimensional beings, not all whales and dolphins (individually, as well as species) are emissaries of galactic consciousness. 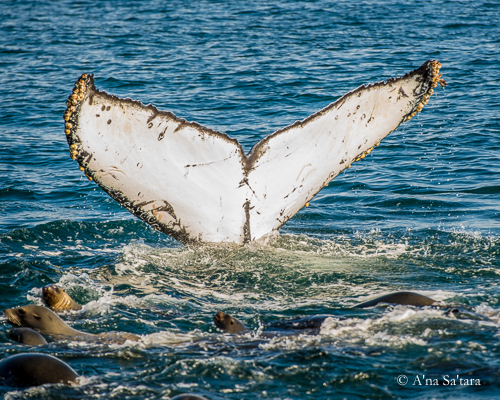 In the past few years, I have taken a particular interest in “whale-watching” on the Monterey Bay. To the surprise of some people, some of my best trips do not even include “seeing” whales. By going offshore, sometimes up to 14 miles, it is possible to connect with different aspects of the planetary energetic grid and obtain a different (and often more clear) energetic perspective than from land. Monterey Bay, and the central and northern California coast, have some very unique offshore energetic channels and emanation points. While it is possible to connect from land, there is a difference resonance from being directly in the oceanic energy field. Also, at different times, and for different cosmic alignments and activations, whale and dolphin lightworkers gather together. Every once in a while we make third dimensional physical contact — reflected in some of the stunning photos on this website — but, most of the time, we connect on the higher dimensional planes through the great “wireless network” of energetic communication. In this way, we support each other in different aspects of planetary service work. The purpose of the explanation above is to shed light on the story that I began with — the apparently benevolent and remarkable actions of whales and dolphins that have been reported worldwide. Of course, conventionally trained scientists explain this from their third dimensional analytic paradigm, considering evolutionary history, parental instincts, and such. There is nothing “wrong” here — it is a matter of perspective. When you perceive more, then a larger picture comes together. From a perspective of multi-dimensional energy and awareness, the third dimensional patterns and natural history are only part of the story. There is a much greater diversity — of soul ancestry and vibration — to consider when relating to the choices, behaviours, and actions of whales and dolphins. As noted above, there is great diversity — well beyond the apparent third dimensional diversity of species and locations. This soul-level genetic diversity creates beings that may “look” similar in a physical sense, but are quite different in a vibrational sense and in their degree of connection to higher dimensions of consciousness.